Although I am not a fan of electronic media, this is one time when print falls short. The only way to do justice to Robyn Hinds’ talent is to hear it! Her powerful, soulful voice lifts glorious praise to the Lord, to Whom she gives all thanks for her awesome gift. In July 2014, Robyn was the Turks & Caicos Islands’ first winner in the Caribbean Gospel Music Marlin Awards, as well as being the first female nominated from the Caribbean in the Traditional Recording category. This adds to her accolade of being the 2011 winner of TCI’s Gospel Best. Robyn Hinds, gospel singer. By Steve Passmore, Provo Pictures. Robyn attended college at Barry University in Florida and was chosen to sing the “Star Spangled Banner” for crowds of tennis fans at the Sony Ericsson Tennis Open, after regularly performing the U.S. national anthem for university events and basketball and football games. 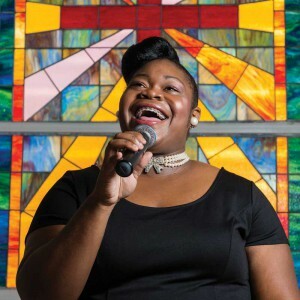 Here, she served as president of the Barry University Voices of Praise Gospel Choir, among other offices, and graduated in 2009 with a B.S. Degree in Economics. Due to financial constraints, Robyn’s recording career didn’t start until she won the title of “TCI’s Gospel Best” in 2010. The prize was the opportunity to cut a CD, and Robyn made best use of the blessing. After working for more than a year in the studio, writing and recording eight original works and one cover, her freshman album, “This Could Be It” hit the streets in March 2013. 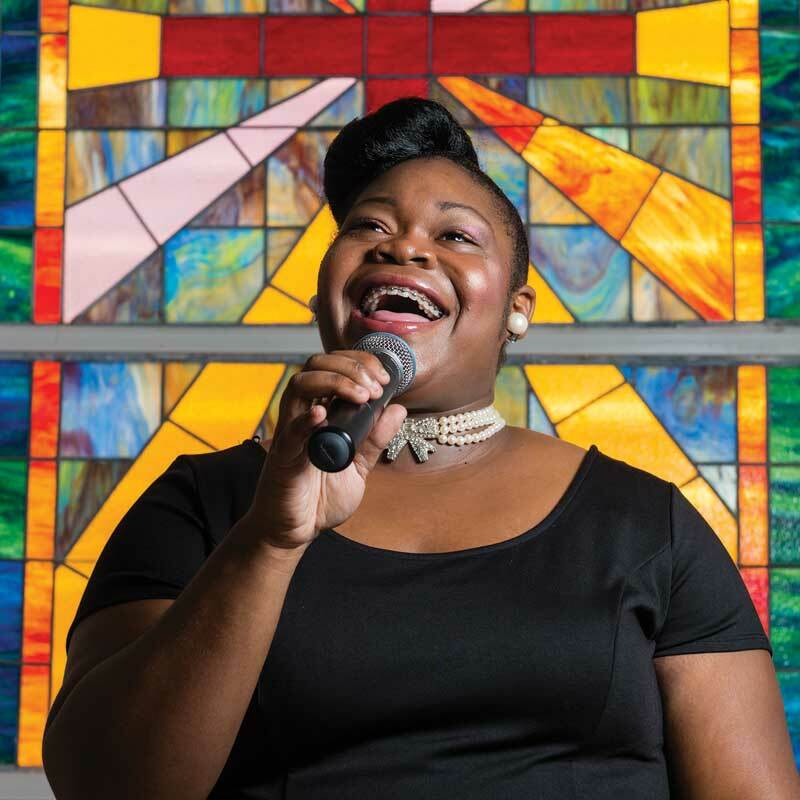 Including contributions from Tito Missick and Pastor Chad Archibald, and a cover of “The Lord is My Shepherd,” Robyn’s mother’s favorite song, the album was quite a success. Besides receiving steady airplay and positive reviews, the blend of contemporary, traditional, and pop gospel has already sold over 600 copies. One song in particular, the original single, “Jesus,” caught the attention of the nominating committee for the prestigious Caribbean Gospel Music Marlin Awards 2014, held annually in Nassau, Bahamas since 1996. Awards are distributed in over fifty categories, with the goal of inspiring and encouraging excellence and growth in Caribbean gospel music. Nominations and winners are selected by a panel of industry professionals. Robyn says she was ecstatic when she learned that she was nominated in three categories: Adapted Traditional Recording of the Year (for “The Lord is My Shepherd”), Traditional Female Vocal Performance of the Year (for “Jesus”), and Traditional Recording of the Year (for “Jesus”). Thanks to a long list of local sponsors (see sidebar) and the enthusiastic support of her loyal Grand Turk community, Robyn was able to make the trip to Nassau in July. As the youngest nominee, Robyn says she was mentored there by a number of seasoned professionals, and welcomed into an international network of gospel recording artists, songwriters, and producers. All are dedicated to produce and create recordings in the spirit of excellence towards the advancement of the Kingdom of God. Although it came as a surprise, Robyn had no qualms when asked to sing “His Eyes on the Sparrow,” for the Marlin Summit event. After all, performing on stage is second nature! Accepting awards is sure to become second nature as well, as Robyn’s rendition of her original song “Jesus” was chosen as Traditional Recording of the Year. “This Could Be It” can be purchased at the Pentecost Book Store and the Unicorn Book Store in Providenciales, and at D.J.’s Variety Bakery and Any Occasion Florist in Grand Turk. It can be downloaded at www.cdbaby.com/Artist/RobynHinds.